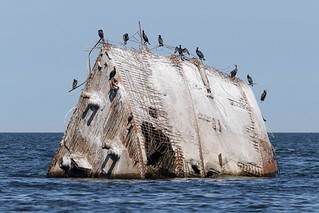 Sunk ship "Lady Cotlin" lies here since early 1950s. Most popular version says that team was deadly drunk and missed Daugava river entrance for around 1km. Other versions - storm, intentionally sunk to get insurance. Interesting fact, that ship is made from concrete. Nowadays it`s located just 200m from the Vecaki beach and moving slowly closer. Shipwreck is loved by Great Cormorants (Phalacrocorax carbo), you can always find them resting here. I have already took photo of this sightseeing 4 years ago, in august 2014.